I didn't take many photos during the process of painting them, because to be honest it was kind of frustrating. 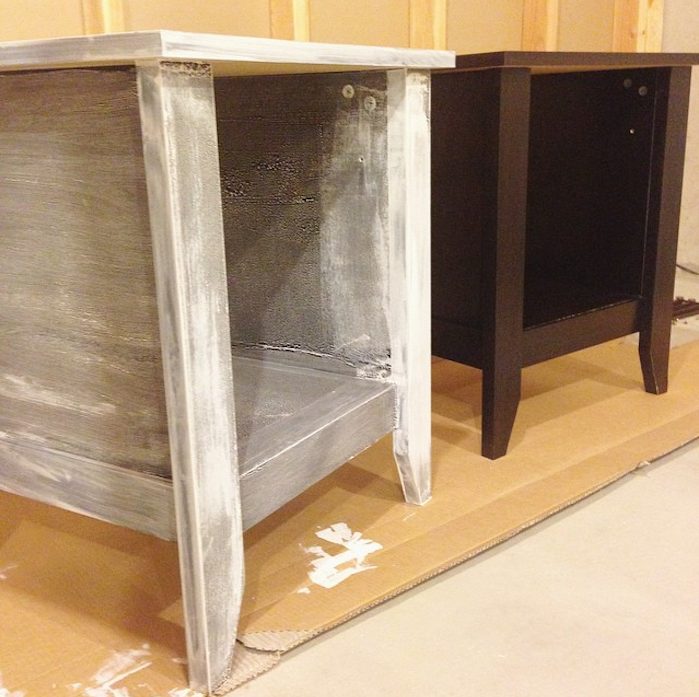 The only photo that I've included during the process is after I applied the first coat of primer onto the left nightstand. As you can see in the inside of the nightstand, the paint wanted to bubble and separate. I thought this was just happening because it was the first coat of primer, but unfortunately it was an issue I faced the ENTIRE time. I ultimately ended up applying 2 coats of primer and about 3-4 coats of paint (I used leftover Behr Swiss Coffee). 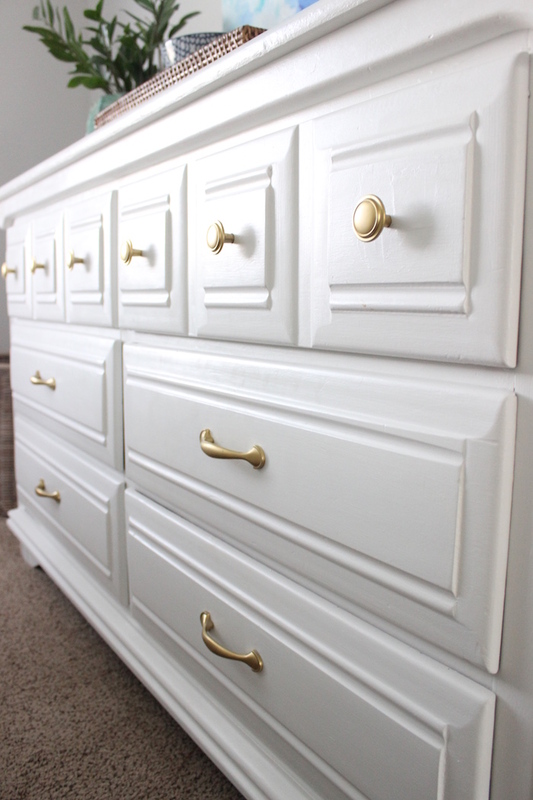 I don't have a definitive amount of coats of paint because the last coat I didn't paint the entire nightstand, but rather I used a foam brushed and "pushed" in the paint where there were still little coverage. 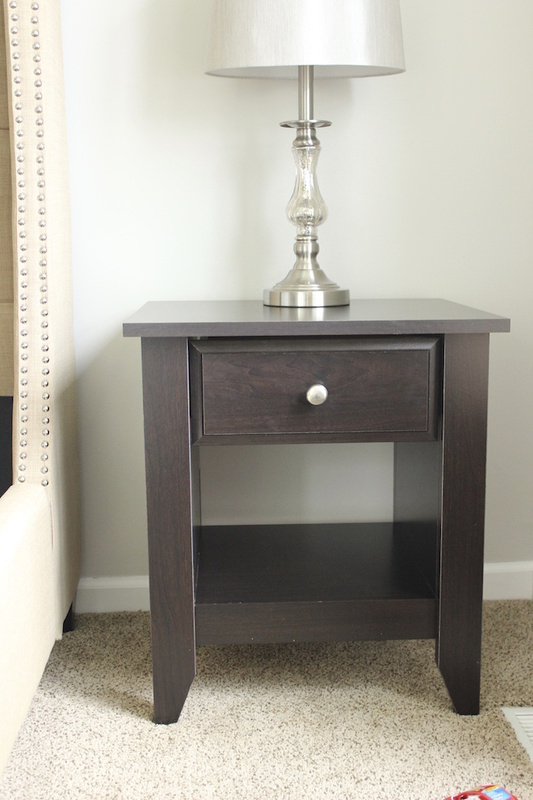 Here are the nightstands after I completed them. They look good, right? I definitely was pleased how they turned out, especially after all the troubles I encountered along the way. That said, I definitely would never buy laminate furniture with the intent to paint it, but if you have laminate furniture laying around like I did, it's definitely worth it, in my opinion, to paint it if you want to change it's appearance. After I posted an image on Instagram about my problems during the project, many followers suggested to use chalk paint on the laminate furniture so if I were to paint laminate again I think I definitely would try that out. It serves as both a primer and paint which would probably make the process a lot easier! As well as painting the nightstands, I decided to change out the hardware. 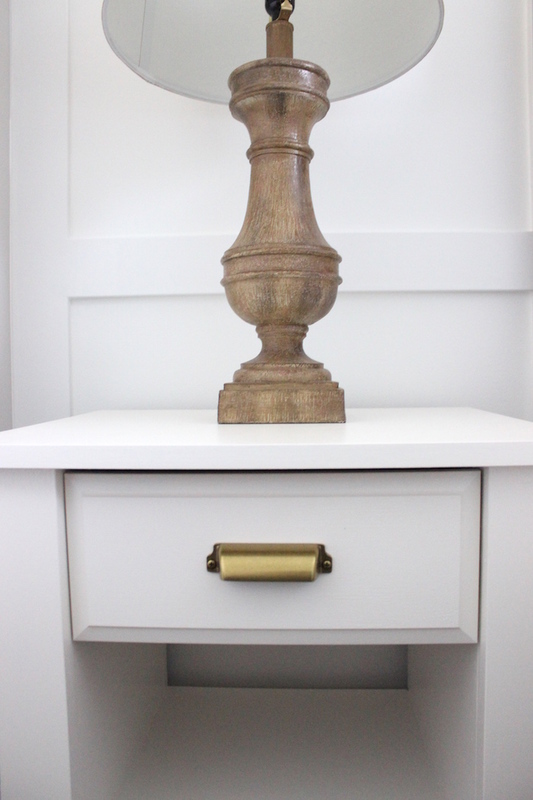 I wanted something that went better with the design of the room so I ultimately went with the Martha Stewart brass pulls from Home Depot and I love how they look. 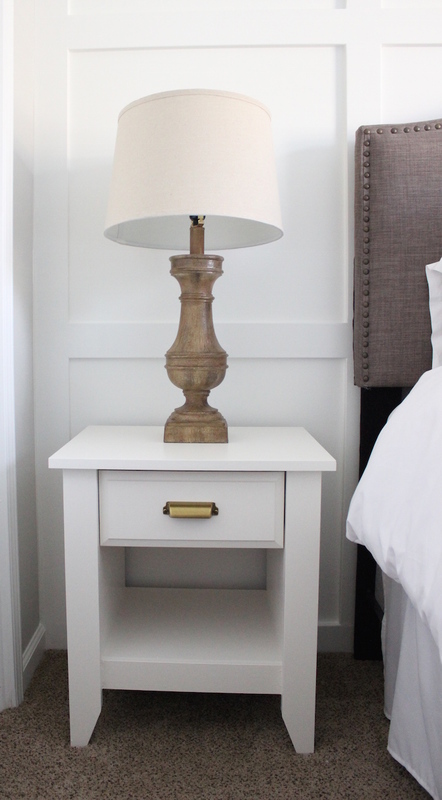 So what do you think of the nightstands? The total project ended up costing $10 because the only thing I had to buy was the hardware for the nightstands since I owned everything else. Although I had some problems along the way I must say this $10 transformation was well worth it! The white and brass look definitely goes better in the space! 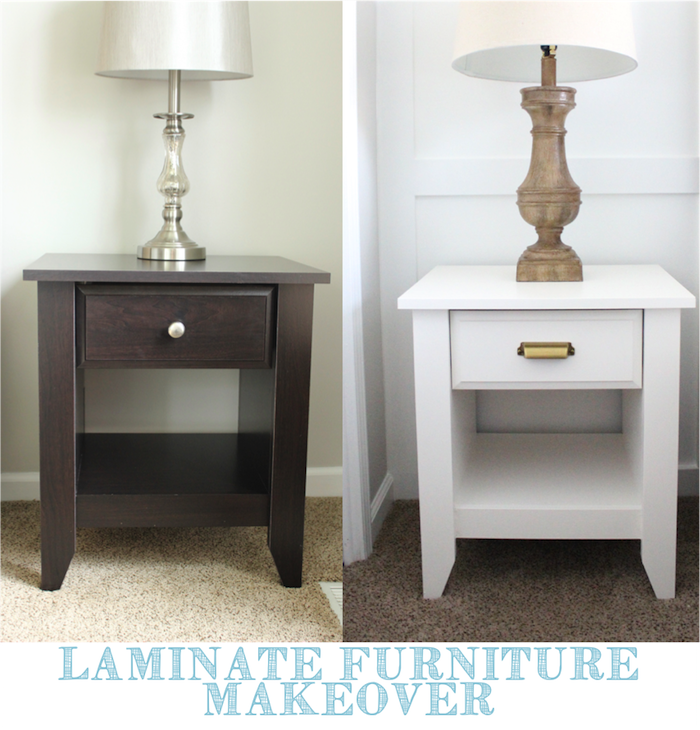 Although people have already given tips to me on painting laminate furniture in the future, I'd love to hear in the comment section below any tips that you might have! 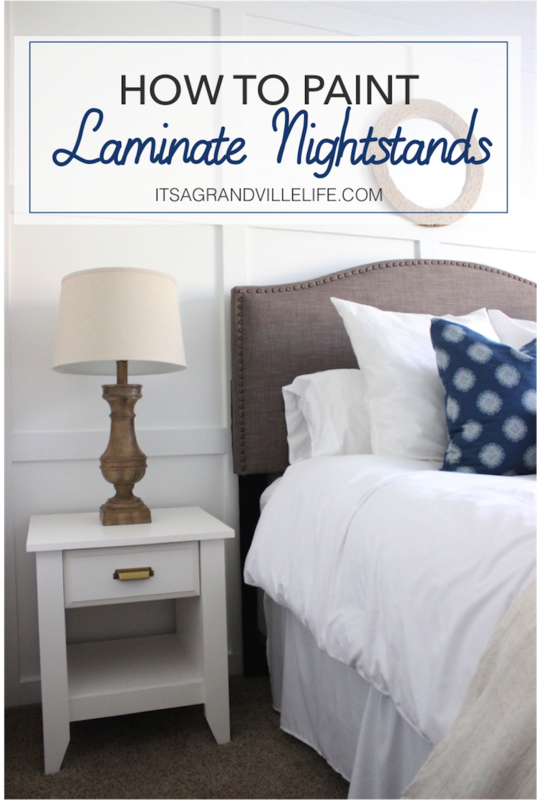 Okay, so I totally showed this to my husband and I think he wants me to paint our nightstands now! You did a great job. Thanks so much for sharing the tutorial! Your tutorials are the best! Also, I looooove that hardware! You're so talented! Thank you Marie!! I'm so glad that I was able to inspire your husband -always a tough job to do! lol Can't wait to see what you end up doing with your nightstands! Outstanding! I would like to praise your work and this makeover is worth an appreciation.